When my children were young, we were an Air Force family and moving from one base to another became a way of life and often a problem for the children when they had to leave old friends behind and try to make new ones in their new hometown. Thus, developing a new friendship became a part of this poem written over 30 years ago when my children were almost grown. Feeling betrayed can also be a part of a new friendship before we truly get to know someone. But that feeling can be turned around when our new friend keeps their promises and a spirit of kindness and understanding grows between them. Dominic Dragon keeps his promise to Jason and does it right away, forestalling the disappointment and turning Jason’s frown into an uplifting smile. 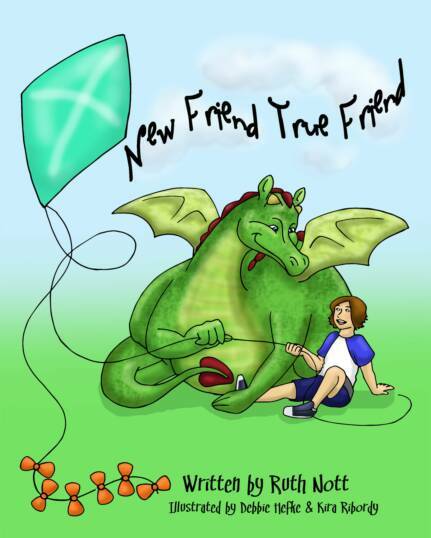 ‘New Friend – True Friend’, written for children age 3-8, teaches a lesson in trust, kindness, and hope while showing concern for others and how important a promise kept can be to a child. Through the printing of this book I hope to encourage children and adults everywhere to believe in themselves and the power of friendship. Talented freelance illustrator Debbie Hefke ( http://www.debbiesART.com) has brought Dominic and Jason to life through her brilliant interpretations of the characters, colorful and delightful imagery, and her devotion to bringing to life the characters and spirit I imagined for my poem when I dreamed of one day turning it into a children’s picture book. How old is the boy - Jason? How big is the dragon - Dominic? What does Jason's mother look like? In what type of neighborhood do they live? - City? Suburbia? Farm? In what season of the year does the adventure take place? What color do you like for the background? What objects should appear in the background? So many decisions to be made! Oh boy, my thinking cap was sizzling! Putting this old brain back to work at 73 was exhausting! After months of waiting and anticipation, on May 1, 2015 I saw the long awaited results in the completed formating of New Friend - True Friend. Let me hear from you in the guest book here and on my Facebook page. Look for giveaways and contests. Recommend other ways to promote this book. "Like" me and post on my Facebook page. Your reviews of the book on Amazon.com would be greatly appreciated! “New Friend – True Friend”, written for children age 3-8, teaches a lesson in trust, kindness, and hope while showing concern for others and how important a promise kept can be to a child. Follow Dominic Dragon and Jason as their friendship takes flight, quickly plummets, and soars again. Here is a nice article published in the Chiefland Citizen on 7-2-15. The photo didn't scan well.